Nice complex comprising 7 units situated in Umbria, near the small town of Otricoli. All of the 7 accommodations provide a personal outdoor area with table, chairs and barbecue. Outside, guests can also enjoy use of a beautiful panoramic pool with solarium area. 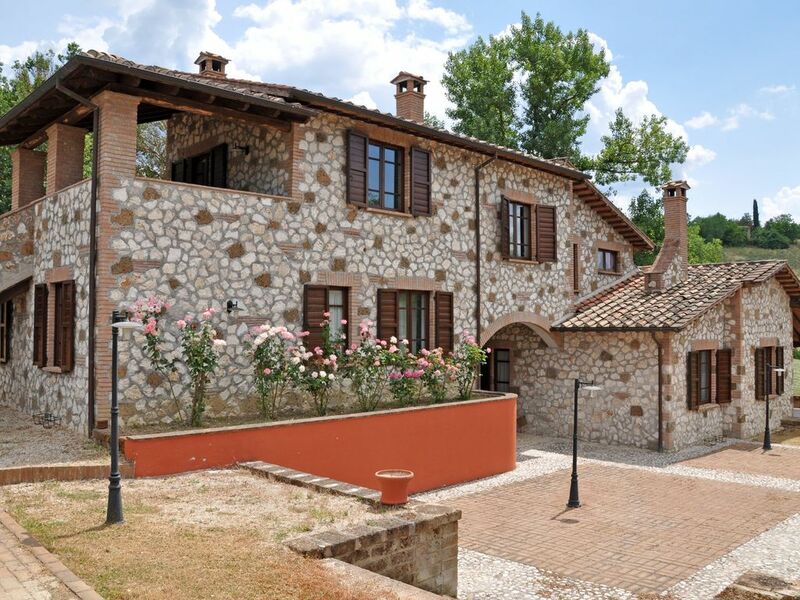 This property is quietly situated and it is in easy reach of Tuscany’s and Umbria’s most important places of interest. The towns of Magliano Sabina and Orte (both with railway station) are a short distance away and offer daily train connections to Rome. The access to the property is via an unpaved road. Distances: Otricoli with shops of all kinds 3 km away, Narni 12 km, Terni 24 km away, Orvieto 65 km away, Rome 75 km away. At guests’ disposal: large, furnished garden with beautiful panoramic swimming-pool (22 x 10 m – min. depth 0,8 m – max. depth 1,9 m – open from 01/05 through 30/09). All of the apartments provide a personal, furnished outdoor area with barbecue. Shared laundry available (free of charge). Extra Services: 5 baby beds available upon request (€ 20,- / each – to be paid on the spot). Maid service by arrangement (€ 12,- / per hour – payment on site). Horse-back riding classes available at 150 m from the hamlet. 1st floor: dining area (satellite TV) with fireplace and kitchen corner (oven, small freezer), double bedroom. 4 steps down: double bedroom, bathroom with shower. Gemütliche Wohnung in sehr schönem Landhaus. Claudio ist ein ganz toller Gastgeber! Schon alleine wegen Ihm lohnt es sich hierher zu kommen! Die Gegend ist wunderschön, perfekt zum entspannen! Vielen Dank für alles!